A Project Veritas video released Thursday night shows Beto O’Rourke campaign staffers discussing how they can illegally use campaign resources to purchase supplies and assist in the transportation of Honduran migrants. Dominic Chacon, a Field Manager for the O’Rourke campaign in El Paso, Texas, expressed his concern in getting supplies to the caravan migrants. 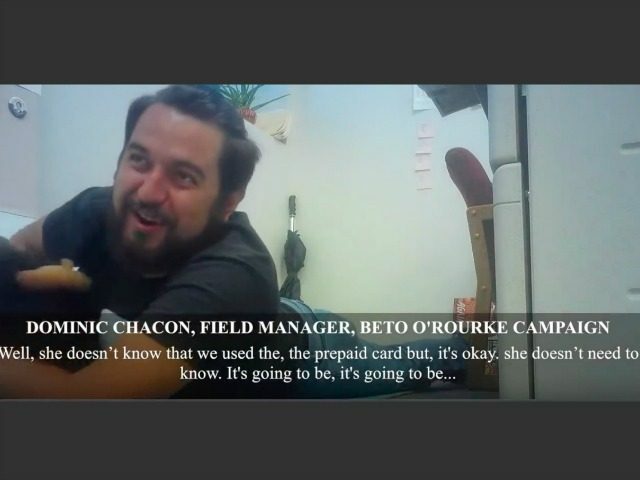 Anapaula Themann, a field organizer for the O’Rourke campaign, insists that the purchase of supplies for the illegal aliens remain a secret in a conversation with Chacon. “Well that’s exactly the food we need. And I will just mark it as, I do have dozens of block walkers,” said Themann. This is the eighth release in a series of James O’Keefe and Project Veritas videos. Other videos exposed the Andrew Gillum campaign in Florida and the Claire McCaskill campaign in Missouri.